Doireann Garrihy has broken her silence on the abortion referendum. Today, the people of Ireland will vote Yes or No to repeal the Eighth Amendment to the Constitution. While Doireann has remained silent on the referendum, which has been widely discussed on social media, the Spin 1038 presenter took to Twitter to explain to her followers that as a full-time broadcaster she’s hasn’t been able to express her opinion. 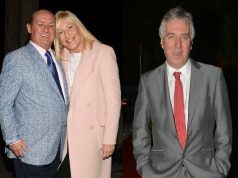 Other broadcasters that have followed suit include RTÉ’s Eoghan McDermott, and TV3’s Cassie Stokes.